Unlike other major CRM products, Sugar offers support, sales and marketing capabilities all in one package. Make it easy for your users to present a unified view of your organization to your customers. Empower your support team to better manage customer support requests through streamlined information sharing and case routing. A listing of all the cases within an Account ensures all your customer facing personnel have easy access to any case status and are better prepared when they engage with a customer. Cases provides an easy view of all the requests and responses between your customer and your organization. 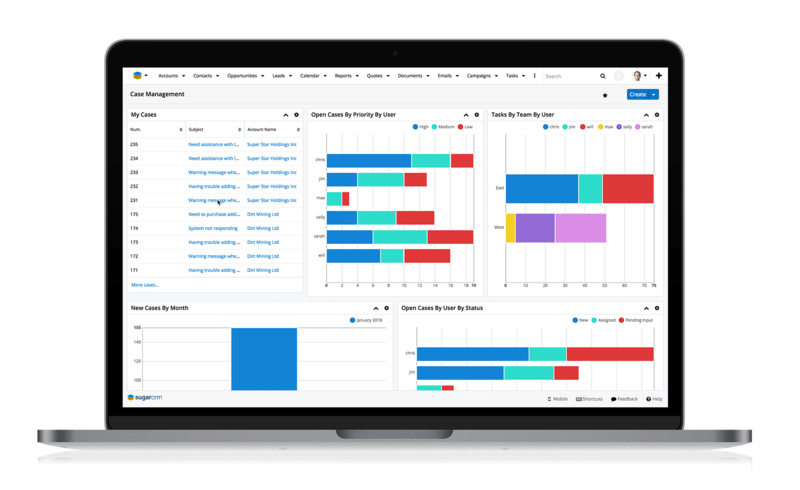 Gain better insights into the performance of your customer satisfaction and support teams.Measure Case metrics, including response time and customer satisfaction rates. Monitor how issues are resolved in your organization. Identify process improvements for setting Case priorities, escalation definitions and resolutions. Define the priority level for each case and rank product defects for faster attention. Route Cases and their escalation status to the appropriate customer support agents and ensure timely resolution. Track resolution times across accounts and agents. Create reminders to ensure bugs are handled quickly and ensure greater customer satisfaction. Sugar’s Inbound Email functionality allows emails to be automatically routed to the right customer support agent that is handling the case. Ensure certain incident categories are automatically routed to the right team for resolution. Sugar allows you to easily manage team resources and productivity. Prioritize issues and allocate Cases based on support agent caseload and expertise. Use Sugar's Bugs module to track and manage product related problems, either found internally or reported by your customers. Tie in each Bug record to other Sugar records such as contacts, calls, case and more. Give your users a way to quickly review all details of the Bug and visibility into its resolution status. With Sugar’s Bugs Module, you gain a complete view of the product problems, their frequency and the effort needed to resolve them. Sugar’s Bugs module not only ensures that customer problems are solved but also help improve your products.